Born in 1962 in Nagasaki, Japan, Hashiguchi shot his first Super-8 film in high school. His feature debut, The Secret of Last Night(1989), won the grand prize at the Pia Film Festival for new directors. His other award-winning films include A Touch of Fever(1993), Like Grains of Sand(1995) and Hush! (2001), which was an official selection at the Directors’ Fortnight at Cannes. 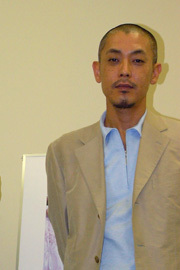 Hashiguchi also works as a screenwriter, novelist, and actor.